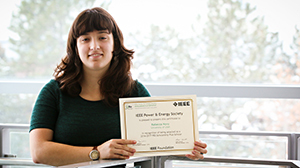 Rebecca Novy, an undergraduate student at the U-Smart lab, is selected to receive an award from the IEEE PES Scholarship Plus Initiative for the 2016/2017 academic year. Rebecca is an outstanding student interested in power and energy systems, and passionate about pursuing her career in the power industry. She is also vice-chair of the IEEE PES Student Chapter at the University of Utah’s ECE Department, helping other students to learn more about the power and energy systems. The award is very selective. Only 230 students across the USA, Canada and Puerto Rico receive the award. The award is given to undergraduate students in electrical engineering who have expressed interest in the power and energy field and who have maintained high GPAs. The $2,000 annual award is renewable for up to three years.